IF there is one thing reality shows have confirmed it is that any subject can be turned into a series. Style Network’s The Glam Fairy, a spin-off series from Jerseylicious, is a manifestation of this fact. Now I’m not going to slam this show or its airy-fairy title – after all, it is Alexa Prisco’s branding – as it is a show that caters for women and their desire to put their best face forward, so to speak. Besides, it isn’t about over-the-top drama and vain personalities fighting for screen time, which is a huge plus. 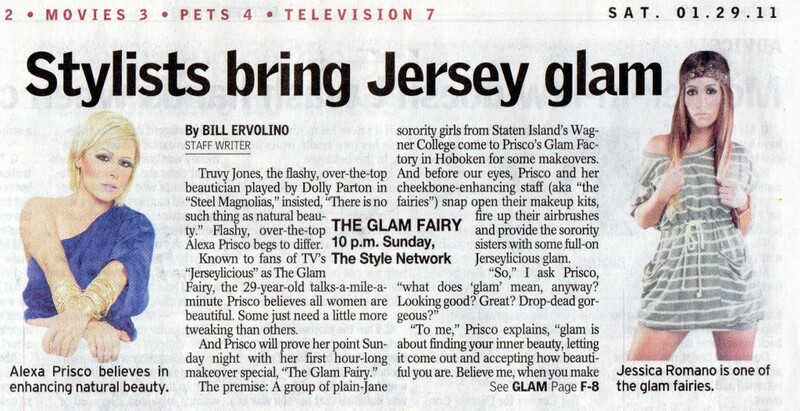 Tonight chatted to Prisco about season two of The Glam Fairy, now airing on our screens. I didn’t know what a “stereo-typical Jersey girl” was, but decided to push on with the chat; I didn’t want to stir up a hornets’ nest. One thing is clear with the soft-spoken but assured Prisco: she is all business. What is she busy with now? “We finished filming Jerseylicious, season five. And it is nice to just be able to enjoy motherhood. I am still running a business, but had to change things a bit. Right now, I do regular business at my house and take my appointments there (The Glam Factory). And the Glam Academy is bigger than ever,” shares Prisco. Prisco is glad she gets to share “all the important moments in my daughter’s life”. She says her objective has always been to deliver. Prisco says a common mistake among women is that they never change their make-up over time. She explains: “People start doing a certain look at a certain age. There is a certain order to their look even though their wardrobe changes. When you redefine that, in a way, they are incapable of seeing that you are changing the filter in their eyes in the way they see beautiful. My mother, for example, always wears coral lipstick. I told her, based on her skin colour, that a rose lip would be best. But she does not listen. Although it works for her! •The Glam Fairy airs on Style Network (DStv channel 173) on Tuesdays at 10.05pm. • The Real Housewives franchise was inspired by the hit TV show Desperate Housewives. It started with The Real Housewives of Orange County and mushroomed to now include spin-offs for Atlanta, New Jersey, New York City, Beverly Hills, Miami and, believe it or not, Vancouver. • Miami Ink put tattooing on the reality map. That snowballed into several other series – LA Ink, London Ink, NY Ink and Madrid Ink. • That trashy Jersey Shore series that everyone was addicted to saw more shows involving certain characters like Nicole Polizzi and Jennifer Farley bagging their own show, Snooki and JWoww. And DJ Paul DelVecchio got his own series, The Paul D Project, while Vinny Guadagnino landed The Show With Vinny. • The drama behind child pageantry made waves in Toddlers & Tiaras, which then lent itself to popular kid star Alana Thompson being signed on for Here Comes Honey Boo Boo. • The Only Way is Essex created a lot of hype when it was released. Several seasons later, some cast members left. Amy Childs, after a stint on Celebrity Big Brother 8, landed It’s All About Amy and Mark Wright, who took part in I’m A Celebrity… Get Me Out of Here!, was signed on for Mark Wright’s Hollywood Nights. • The list of spin-off shows – I won’t even get into the insipidness of Keeping Up With the Kardashians and the shows attached to it – is long, but you get the picture of this trend in TV land. Stops By GossipGram With Some Tricks To Looking Fab! Check out this video of Roseanne Colletti and Bonnie Fuller chatting with “The Glam Fairy” Alexa Prisco of Style Network’s ‘Jerseylicious’! Bonnie Fuller of HollywoodLife.com and New York NonStop’s Roseanne Colletti learn how to get Kim Kardashian eyes and a Jennifer Lopez bronze glow from “The Glam Fairy” Alexa Prisco of The Style Network’s ‘Jerseylicious.’ Be sure to tune in to STYLE on Sundays at 10pm to see “The Glam Fairy” in action! We learn the tricks to looking fabulous! Can’t wait to share it with our BFF’s! Check out both My Style and OK Magazine releasing the news that I am having a baby girl! How exciting! Record breaking season premiere of Glam Fairy!! The Style Network’s premiere of the new makeover docu-series GLAM FAIRY on Sunday at 8:00pm was glamming with Women 18-49 (249,000) and Women 18-34 (140,000), becoming the 2nd highest premiere for the network, after “Tia & Tamera,” according to Nielsen. GLAM FAIRY more than doubled the network’s prior four week primetime average, delivering as much as a +146% increase among Women 18-34 (140,000) and a +133% increase among Women 18-49 (249,000) which led to over a +100% increase in Total Viewers (443,000). The new makeover format show takes viewers inside the glittery, high-energy world of makeup artist extraordinaire and GLAM FAIRY herself, Alexa Prisco. After leaving the Gatsby Salon, Alexa establishes a new business headquarters – ‘The Glam Factory’ – to serve as home base where she can showcase her makeover magic and build up clientele. Each fashion and beauty-centered episode will follow Alexa, accompanied by her team of “fairies,” as she takes on new clients and uses her signature New Jersey style to transform women with hot new looks for all kinds of special occasions. AOL Style List. Another goodie!! !